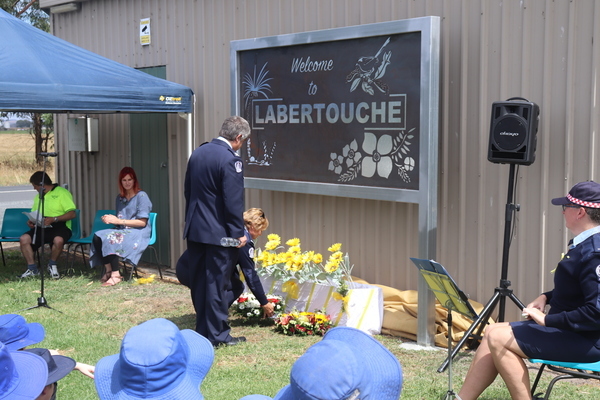 Those are the words that treasurer of the Labertouche and District Community Centre Lorraine Box told the community of Labertouche exactly 10 years after the Black Saturday Bunyip Ridge fire ravaged their town. She stood in front of around 100 community members, school children and firefighters, in the precise spot that had acted as a staging station on that horrific day a decade ago. The commemorative service thanked the heroic firefighters and recovery volunteers and paid tribute to the families who lost 31 homes in the Bunyip Ridge Fire and the 173 lives lost state-wide. With the unveiling of a new commemorative town sign, the service also acted as a new chapter in the community’s history. 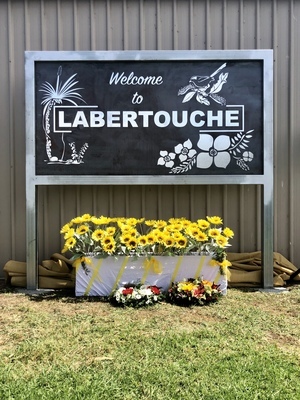 Designed by local artist Gail Trollope, the sign, which features a blue wren, grevillea, fern and pink boronia, was designed to tell the story of Labertouche. “I took a lot of photos of before and after the bush recovery and it was amazing to see (how) … the grevillea and the boronia just exploded up there. Before that fire it was only in a few pockets – you would be lucky to find them but now they’re everywhere. Likewise, Ms Box said the humans of Labertouche had been on their own journey – and while many were still recovering, little could have been achieved without the help of others. 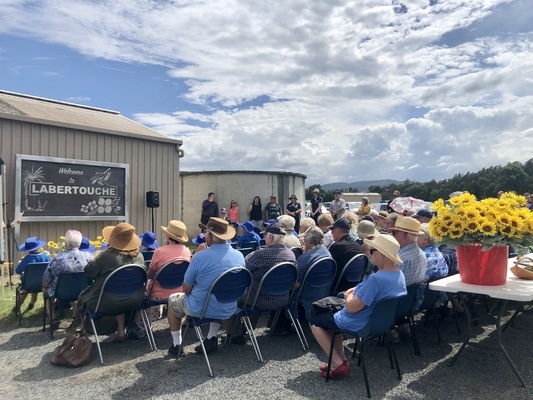 She also praised the addition of the new community centre, men’s shed, barbecue area, cricket pitch and fire station and their part in keeping the community together throughout trying times. “This is our journey. And we now have the privilege of being in a position to keep our community connections and strengthen friendships daily. “One thing that stands out over the years is the random acts of kindness that were given freely and with care to all of us. In some of our darkest times, we were visited by others who were giving out gifts of kindness to us. And although humbling, it was this kindness that gave us the strength when we needed it the most. “But the best thing to happen in the last 10 years is the friendships and support of each other that has been born. We didn’t get here on our own – we had a lot of help along the way and for this, we thank each and every one of you. 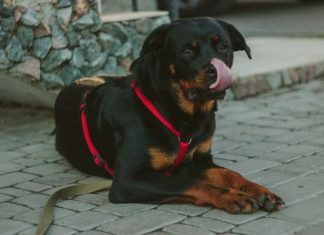 Ms Box also praised the efforts of firefighters and their courageous efforts in keeping Labertouche as safe as possible. “Over the past weeks I’ve had several telephone conversations with firefighters and sadly the one thing that has resonated with me the most is that some of the volunteers have a feeling of regret for the failures of the day,” Ms Box said. “There was no failure on that day or the days that followed … there were only successes. To all of you firefighters, past and present, you are our heroes and you will always remain heroes in our hearts. “We were the luckiest people in the state that day because we had a fire in the forest for a few days’ previous and we got the opportunity to prepare – that’s why all you (firefighters) were already on site. “If you guys hadn’t have been here it would have been a very different outcome for Labertouche. It was a hard fight for us all and we were all still here at the end of the day to tell the tale – how lucky were we that you guys all came to town?